An artist’s impression from the development application of the proposed build-to-rent project in the city. A 16-storey apartment block planned for Civic West that will cater mainly to students and short-term accommodation will be the first in the ACT to be developed under a build-to-rent model. 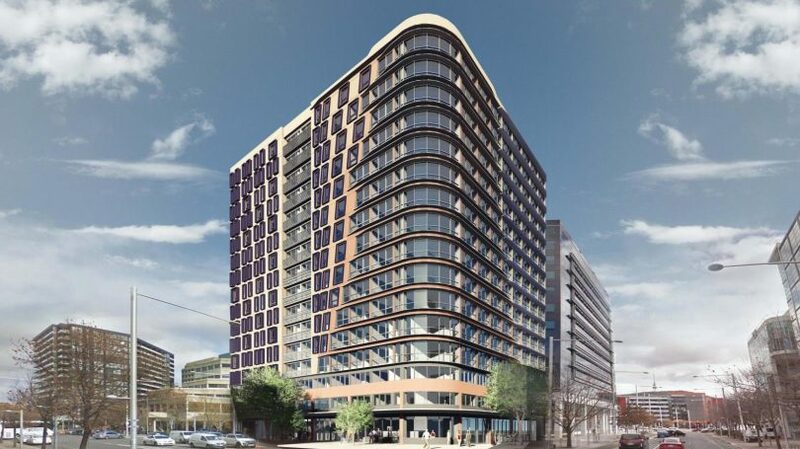 A development application has been lodged by Rovera Construction Pty Ltd but the company behind the project is Innovate Real Estate Advisory, whose website says one of its specific areas of interest is development sites for student accommodation in Canberra, Sydney, and Melbourne. The site on the corner of Moore and Rudd streets is near the Australian National University and is currently a four-storey building that will make way for a new apartment block containing 362 micro-apartments with a total of 501 rooms and a range of accommodation options, including share apartments, studios and individual apartments. But residents will be expected to ride a bike, catch a bus or walk, with little parking provided. The build-to-rent model means the development will not be assessed as multi-unit housing but as commercial accommodation. The DA says residents enter into an occupancy agreement with an accommodation provider rather than a residential lease with a landlord or property agent. The development will include an onsite team to manage leasing, day to day tenancy issues, building maintenance and management, and other services. Planned communal facilities include private dining areas, café/retail spaces, cinema and gaming areas, gymnasiums, library, study spaces, a co-working facility and lounge spaces. There will also be communal outdoor areas including a podium and rooftop terrace with garden space. Residents will also have access to an on-site car sharing service and bike sharing service, as well as secure storage for 110 private bicycles in the basement carpark. But only seven car parking spaces are listed, of which five will be used for a car share scheme, and two for staff parking, as well as seven motor cycle parking spaces. “It is anticipated that as student and short-term serviced apartment accommodation, the vast majority of occupants are not expected to travel to or from the site by motor vehicle, but rather will be expected to travel by bicycle or walking,” the traffic assessment by Graeme Shoobridge Advisory Services says. Further, because the proposed development is not a residential multi-unit development, it will attract ‘no minimum requirements’ for car parking in the City centre. For residents who do own a vehicle, the traffic report says there is a good supply of commercial car parking nearby that is vacant outside of business hours, such as City West Car Park. But the limited parking on site will encourage sustainable active travel and use of public transport by residents, the traffic report says. The proposal also lists paving upgrades, installation of a bicycle rail, street infrastructure and landscaping, ground-level awnings, signage, site servicing and driveway access from Mulwala Lane.